You just know that if Thelma & Louise were hitting the road today, they would at some point take a selfie. 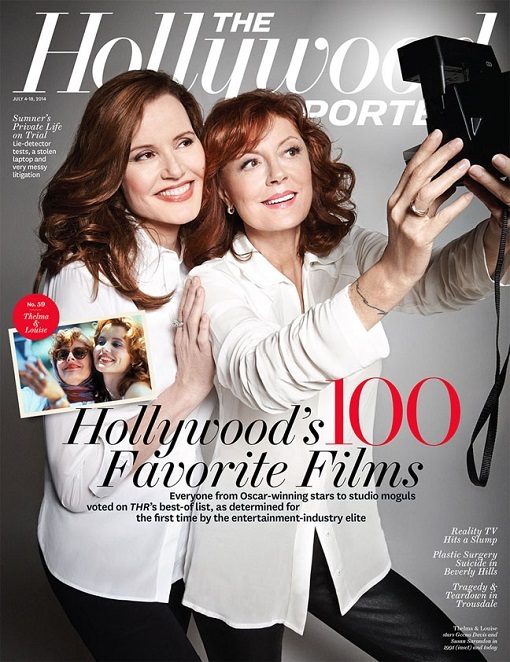 Recently, co-stars Susan Sarandon and Geena Davis did the next best thing, and an image to that effect adorns the cover of this week’s The Hollywood Reporter‘s compilation of Tinseltown’s 100 Favorite Films. In a sidebar video interview, Davis notes that when she and Sarandon walk down the street together in NYC and do lunch, “there’s a lot of traffic stopping and, like, ‘Oh my God! '” And probably, on the right day, a couple of selfie poses with fans, we imagine, as well. The use of a Polaroid for the cover shot is a nice retro touch by THR.